Oh yes! We had tons of little rippers out learning how to roll in, do tic tacs and more. Yeah for summer fun skate sesh. We have one last skate session next Saturday! Tons of gals out skating under the instruction of Carrie and her Rooks crew! What a fun turnout! Skate Like a Girl tour are getting amped for the long journey to Winnipeg. Tomorrow skate stops include: Greenlake, Marginal, Bellevue Plaza, and end up at Skatebarn for a clinic at 4 followed by a demo! Then a quick stop to pick up Fred Luyet, and Nina Suesstrunk's luggage that took a journey without her. Roll into Vancouver at night! Kristin does it all! Skates, plans tours, teaches, and fixes her shoes. Come shred and sew Sea Sk8! Vancouver, BC! Dear and Yonder Premier! Aug 6! Winnipeg or Bust's first stop in Canada will be in Vancouver! Come to the clinic and jam at Strathcona and then come to the Antisocial (2337 Main Street) shop to view the Dear and Yonder film @ 6pm! Aug 8th EPIC Premier in SF!!!!!!!!!!! There is nothing like this all female surf movie (and it features female skaters too)! 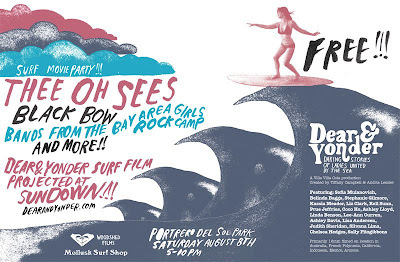 Created by Villa Villa Cola Productions, this film premiers in San Francisco on Saturday August 8th at starting at 5 pm at Potrero Del Sol skatepark. -Bring your board and skate the park! The SLAG crew will be there along with featured skaters from the film. -Starting at 5pm, enjoy local bands, including a set from the little ladies of the Bay Area Girls Rock Camp, Black Bow, and Thee Oh Sees. -Have a picnic with friends, bring a blanket and food. -Movie will show on a giant outdoor screen at around 8:30pm.